Great place to stop for the night! Clean, reasonable and the staff/owners were great!!! Would stay again! Easy on and off to 64 and 57!!! Sonic, Subway and Tractor Supply Co a short walk away! Building a Japanese Steak House across the street. Oh, and there is an ice dispenser machine on the premises. 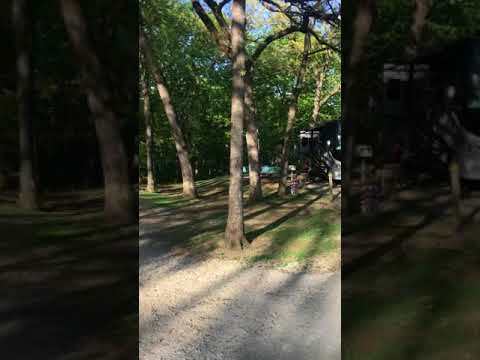 This campground was FULL all weekend! The staff was great! The mini donuts they delivered to your site in the morning hit the spot! No road noise…….. but there is a train! The only downside was that we had to pull ahead in our site to get satellite signal. So we had to back up to dump. We were only there for two nights so it wasn't a HUGE hassle! nice and quiet! Great for a few day rest stop. It is right off of 8 highway. About 5 miles from I-44 (easy access east or west bound). The sites were kind of tight. But there was shade and picnic tables at the site. The owner helps backing in. There are some trails to walk yourself or your pup! We didn't have a run around vehicle but Meramec Springs is not far - nor is the small town of St. James (known for the winery's). The only issue is the full hook up area is a big parking lot with no shade! BUT you have great satellite signal!~ also the water in 10 & 11 is slow.We have stayed here many time! They have an awesome Halloween Spooktacular!!!! This is a Military Campground (not quite a FAMCAMP - more a Recreation Area)! They have four areas - tent, water and electric, full hook up and cabins! We have stayed here may times - typically with the full hook ups. It is NOT off I-44 but off US 54. We have stayed up there in March, April, May, June, July, August, September and October! This is a great park! The free trolley stops IN the parka and will take you to various points in downtown Branson! Easy in and out. Office was helpful and friendly! You will have Highway noise but, there is an RV Dealer right there! Great Service too!!! We went there for opening day 2018!! Gravel parking lot with full hook-ups! This is more of a "long-term" campground than for any vacationers. We had gone there because we were having work done in O'Fallon on towed vehicle. I would never stay there again! Nor would I recommend it. Very comfortable, shaded, not much satellite or over the TV signal. We stayed for 2 nights (short getaway). Dinner was delivered with a smile after driving through a spring storm. Pool looked nice. The sites were kind of tight.